The movie excitement surrounding The Hunger Games has put the series back on the brain. I thought I would share my thoughts on this trilogy starting with the first book. I'll admit to liking my books a little on the sick side, but the sheer volume of people who have read and loved this book is a testament to Suzanne Collins's talent. She puts kids in an arena, has them fight to the death, and people can't get enough. 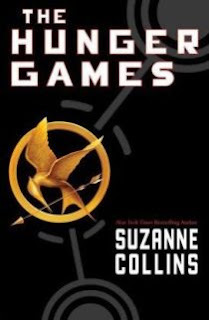 The story follows Katniss Everdean, a courageous teen who will represent the twelfth district in the annual games. Katniss has to out wit, out last, and out play... OK, I was trying to see if you were paying attention. The games really are a perverse reality show, but it's not your typical Wednesday night entertainment. Suzanne Collins has created a captivating dystopian world lead by a capitol who uses these games to keep the districts in fear and in line. It also keeps the readers reading! This book truly defines "page turner". I believe Entertainment Weekly said it takes the average person 17 minutes to read this book. It's a little bit of an exaggeration, but you get the point. I'm not the type of reader who can easily read an entire series back to back. I like to take breaks between books to read other things. It helps prevent reader burn out for me. This series was a big exception to that rule. Thankfully the entire trilogy was out before I read The Hunger Games. If you haven't checked out this series yet, I highly recommend it. If you have checked it out, let me know your thoughts! 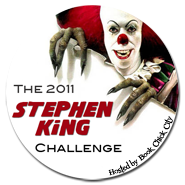 I've decided to join a couple of fun challenges over at Book Chick City! 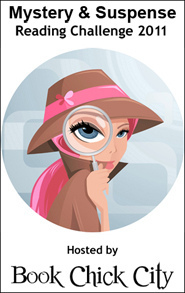 The first challenge I'm joining is the Mystery & Suspense Reading Challenge. • You can join anytime between now and the later part of next year. • At the beginning of Jan 2011, you will find a link to specific month to add your reviews. There will be a monthly prize too courtesy of the lovely Simon & Schuster - you must be signed up to the challenge and add the link to your review to be entered into the monthly prize draw. • At the beginning of Jan 2011, she will add a link so you can add your reviews. If you are participating in either challenge, let me know! 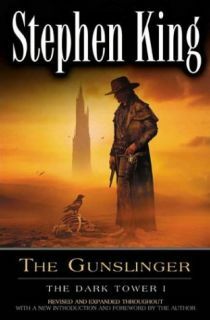 The Gunslinger is the first book in Stephen King's The Dark Tower series. 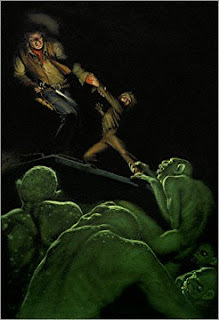 This heroic fantasy, set in a world of ominous landscape and macabre menace, features one of Stephen King's most powerful creations-The Gunslinger. The book opens with "The man in black fled across the desert, and the gunslinger followed.". (A favorite quote among Dark Tower fans.) The Gunslinger follows Roland's journey across the desert searching for the man in black. I have no other way to say it, but I didn't particularly like this book. I felt lost, I felt confused. I felt disappointed by acts I did not know would serve a purpose later in the series. This book seems to be either the start or the end of most readers' Dark Tower journey. I read this book about 10 years or so ago, and I didn't give it another try until just a few months ago. I'll talk more about the second book in the series this week, but I will say I was glad to pick the series up again. If you would like to give this series a try, but you find you are just not getting in to or enjoying The Gunslinger - skip it. That's sounds kind of crazy, but it's actually not crucial that you read it. Book 2 begins with an "argument" containing the only information you need to draw from book 1. My honest recommendation would be to read The Gunslinger's wikipedia page and start with book 2. Someone suggested to me that The Gunslinger would be a good read at the end of the series rather than the beginning. I find that to be a fair recommendation. Have you read any of King's Dark Tower books? I'd love to hear from you! My most anticipated book so far this year is The Informationist: A Thriller by Taylor Stevens. Corporations need her. Governments pay her. Criminals fear her. But nobody sees her coming. It sounds like a really great read, and the author has such an unbelieveable background growing up with a communal apocalyptic cult. You can read more about The Informationist - and the author - in my previous Waiting for Wednesday post. Did you know you can read ebooks on your computer or phone without owning an ereader? I've included links to free apps at the end of each section. Download free Kindle apps for your computer or PC here. Download free Nook apps for your phone or PC here. Download more free public domain books from Project Gutenberg. The Story Siren is having a large ARC giveaway on her blog. Cindy at Books Complete Me is giving away a copy of Delirium by Lauren Oliver. Do you have any book related freebies or giveaways you'd like to share? Please add your link below or share them to the comments. Did you snag any free books today? Let me know in the comments!